Sun., Feb. 22, 2004, 9:46 a.m.
Now the walls bow from the babel and the floor trembles from the stomping feet of students getting their tuition’s worth on a Saturday night. But in the earliest days of The Kennel - long before it was ever called that - you could have heard a bone snap. Really, it’s the first sound anyone did hear. It was Nov. 24, 1965. In nine days, the Gonzaga Bulldogs would christen their new basketball arena - OK, their new gym, Kennedy Pavilion, against rival Washington State, and the Zags were finishing practice with extra wind sprints. Gary Lechman, at the time perhaps the best 6-foot-4 center in college basketball, was churning them in the only gear he had - fifth - and without thinking stuck out his arms to brake against Kennedy’s unpadded wall. Amazingly, the wall didn’t give. Lechman broke his arm just below the elbow and without him, the Zags were chopped up by WSU, 106-78. Not only that, the Cougs recovered their catnapped mascot, Butch VI, and took him back to Pullman. Not the most auspicious start for the new building. The show is almost over. Next season, the Bulldogs move into a new 6,000-seat arena - not a gym - next door. So on Saturday afternoon, the Bulldogs will play their final game at what has become known, colloquially and defiantly, as The Kennel. A 34th consecutive sellout audience will test the limits of the human larynx - and will include former players invited back for the moment and an unassuming fan who will have witnessed 500 of the 501 men’s varsity games played in the joint. It will be a party and a memorial - and not because The Kennel is a storied structure in the class of Allen Fieldhouse, or Pauley, or Cameron Indoor. It is both less and more. As a home court, it has grown big, ugly, Bulldog jaws - the Zags are 386-104 (78.7 percent) in The Kennel in 39 years, but 148-11 (93.1) since 1991. So rare are home losses that they take on a death-in-the-family vibe. Of course, that’s mostly because the program itself has grown sharper teeth. But even as he presides over the nation’s sixthranked team, current coach Mark Few refuses to devalue what Kennel living has meant to his team. “It’s not something you can easily put into words,” he said. “It’s so loud you can hardly think, yet because you know you’re in The Kennel, there’s an inner peace that comes over you. The “wow” moments seem to have increased exponentially since the Zags and national notoriety became an item, and yet a broader perspective (see accompanying list) reveals that great games in The Kennel go way back, too. 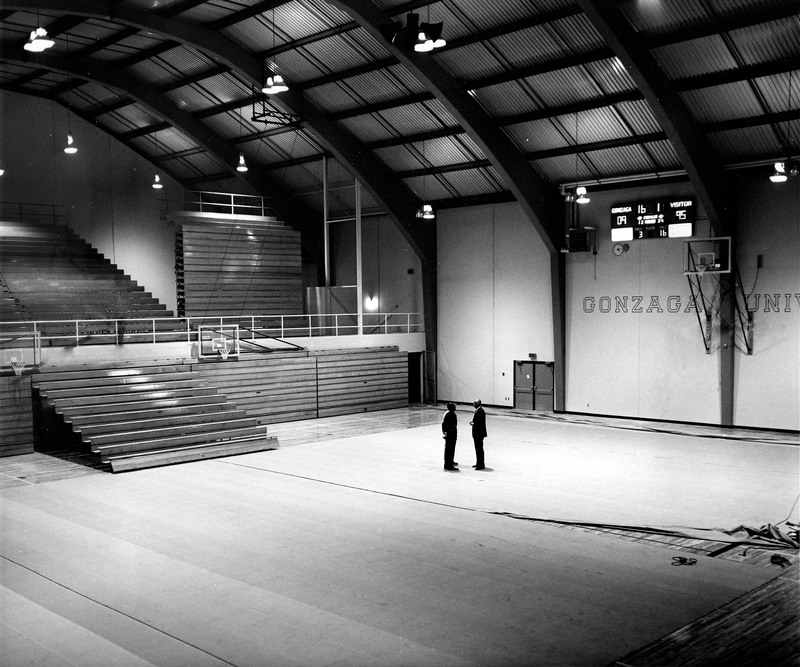 And while the new palace has been called the final puzzle piece for this improbable program, it’s time to acknowledge how this old house probably saved Gonzaga athletics. When he came to Gonzaga as basketball coach and athletic director in 1952, the Bulldogs were coming off the best run of basketball in their history. The Navy V-12 team of 1944 had gone 21-2 and was considered the best in the Northwest, and after the war the trio of Rich Evans, Jack Curran and Frank Walter led GU to 79 victories in four years and trips to two national tournaments. But so much of the Gonzaga mentality still mourned the dropping of football in 1941. Then the plug was pulled on boxing, which had won a national championship in 1950. Basketball played its games in a tiny and dingy hole in the Administration Building - where Russell Theater is now - and was still something of an entertainment afterthought. Slowly, key figures - including Rev. Arthur Dussault and Gonzaga regent Dr. Edgar Fitzgerald who had been a basketball teammate of Dussault’s in the 1920s - began to agitate for a new athletic facility. But there were other building projects needed first, and Anderson - knowing he had to grow the program - moved the bulk of his games to the new Spokane Coliseum, even though the $500-a-night rental limited his home schedules to 10 games a year. That got him enough games to take GU to major-college status in 1958, and into the new Big Sky Conference in 1962. It wasn’t until 1964 when the regents granted approval to take bids on a $1 million athletic facility. The gymnasium, swimming pool and offices were completed in less than a year, and in November 1965, Sen. Edward Kennedy came to Spokane to dedicate the pavilion in honor of his brother, the late President John F. Kennedy. “Without knowing we were going to build Kennedy, I don’t know if I get (the program) to where we did,” Anderson said. Behind Lechman and guard Billy Suter, the Bulldogs won back-to-back Big Sky championships those first two seasons - Lechman recovered to score 37 points and beat WSU in a rematch in Pullman that first year. After that opening loss - in front of the building’s first sellout of 4,300 - GU reeled off 18 straight home victories before losing to Idaho in 1967. Of course, that really wasn’t the very first game. The Gonzaga and WSU freshmen played a preliminary, won by the Coubabes 91-64. Don Migliuri, a regular in the stands at current games, was at center court for the opening tip of that one; another current season ticket holder, Jud Heathcote, coached the WSU frosh. That trivia is courtesy of Mike Shields, a GU grad who has managed to see all but one of the 499 men’s varsity games in the building - and who knows how many others? His alibi was solid - he stayed to check up on a number of former Zags, including Bakari Hendrix (who was playing in the NBDL) and Jay Sherrell and Germayne Forbes, now at West Georgia. Among Kennedy’s early features, recalled Shields, was lighting “that was really poor. Well, it’s always been listed as a bigger arena. The published capacity of 4,000 is science fiction as much as anything written by Ray Bradbury - which is not to say there has never been 4,000 in the building. On Feb. 28, 1981, a crowd that was every bit the announced total of 4,731 jammed Kennedy - including the old west end-zone balconies on the second and third floors - to watch the Bulldogs score a 79-67 upset of a University of San Francisco team that included two future NBA players and NFL linebacker Ken McAlister. If that game wasn’t a turning point for Gonzaga basketball, it certainly probed the possibilities. Average attendance that year topped 3,000 for the first time, and would again for John Stockton’s senior year in 1984. Two years later, the arena underwent a renovation and returned as Martin Centre - trustee Charlotte Martin having donated $4.5 million to fund the remodel and the addition of a fieldhouse. At the time, athletic director Dan Fitzgerald urged university president Rev. Bernard Coughlin to ask for additional funds to build a new 5,000-seat arena. But Martin was adamant about the bulk of the money going to expanding recreational facilities for the student body. Rejoice, too, that the building didn’t lose the compact, reach-out-and-touch the players feel that has made it such a snakepit for visiting teams - or the lousy accoustics which turn every handclap into a cacaphony. Having overseen the renovation of the building, Fitzgerald then returned as coach to oversee the renovation of the program - and took a big step in 1992 when the team led by Mead High School alums Jeff Brown and Jarrod Davis won 20 games, a first in 44 years. Somewhere in there emerged the phenomenon of the Kennel Club, the student cheering - and jeering - section that alums of four different decades take some credit for, though it hit its stride in the ‘80s. And then went nuclear the last few years. And Few knows he’ll miss it - but as a guy who just built a new house himself, he appreciates the dynamic of change. Best of all, the old house will be right next door. Though when the Zags walk inside now, the silence will be deafening. Published: Feb. 22, 2004, 9:46 a.m.